Preppers and survivalists want to be able to take care of themselves and their families in any situation. They don’t want to be dependent on others in emergency situations, for example FEMA or the Red Cross. These are all events we have seen happen in the recent past, even in our own country. So I think you can agree with me that preparing for these types of events is just good common sense. ​And I can’t blame them, because there are hundreds of things you can do to become more prepared, so this can be overwhelming. 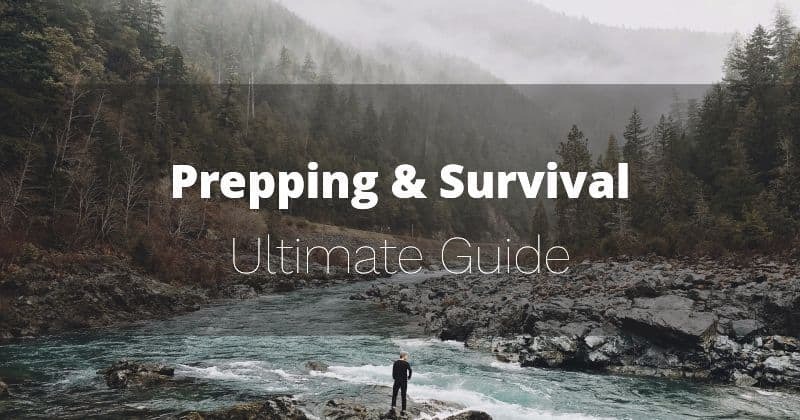 That’s why I created this guide for prepping and survival, to provide you with all the resources you need to get started right away! ​This guide is divided into several chapters. If you click on one of the chapter titles in the table of contents below you will jump to this chapter without refreshing the page. So pick a chapter you are interested in and get started! Water is an essential resource for survival. You can go a long time without food but you cannot go long without water. You should take the necessary steps to store emergency supplies of water that you and your family can use to drink, cook and wash with in case of disaster or emergency. Here are some great resources to help you get started with your emergency water supplies. Water is your most vital resource for survival, but you also need food. Without food your body will not function properly, if at all. And in case of an emergency or a disaster you and your family may not be able to get food for several days or even longer. That's why you should take steps to build up an emergency supply of food so that you will be prepared if something happens. It is likely you will not be able to use your microwave, electric stove or gas stove after a disaster or emergency happens. But you will still need to cook your food in those situations, so it is a good idea to be aware of alternative cooking methods. Here are some good resource to help you get started. In case of injuries or illnesses in situations where you don't have access to modern medicine you are on your own. If you ever find yourself in such circumstances you will be glad you took some time to become medically prepared. This chapter contains some excellent resources on medical preparedness. Like food and water, shelter from the elements is also one of our most basic needs. But staying warm or keeping cool when the weather is extreme can be a challenge. Take a look at the great resources in this chapter to prepare yourself for these situations. It is a good idea to prepare a communication plan in case of emergencies, disasters or other survival situations. Having the ability to obtain and share information in those situations is very important. Here are some awesome resources about communication options when the world goes dark. By the way, if you are looking to buy a walkie-talkie, you should definitely take a look at my best walkie-talkie guide! A well-know prepping phrase is “If you can't protect it, you don't own it”. What good does having enough food and water do you if others can simply take it from you. That is why security and defense are an important aspect of prepping and survival. Here are some fantastic resources to help you prepare to keep yourself safe in a survival situation. This chapter lists several comprehensive checklists of supplies for preppers and survivalists. You can use these checklists to get ideas for your own stockpile of supplies and also to make sure you haven't forgotten anything important yourself. There are a lot of prepping and survival books on the market, so it is difficult to assemble a good list of recommended books. That's why I decided to use the books from the "Recommended Reading" chapter from the excellent Prepper's Long-Term Survival Guide by Jim Cobb. Great read. Great blog. Stay strong and keep prepping, my friend.